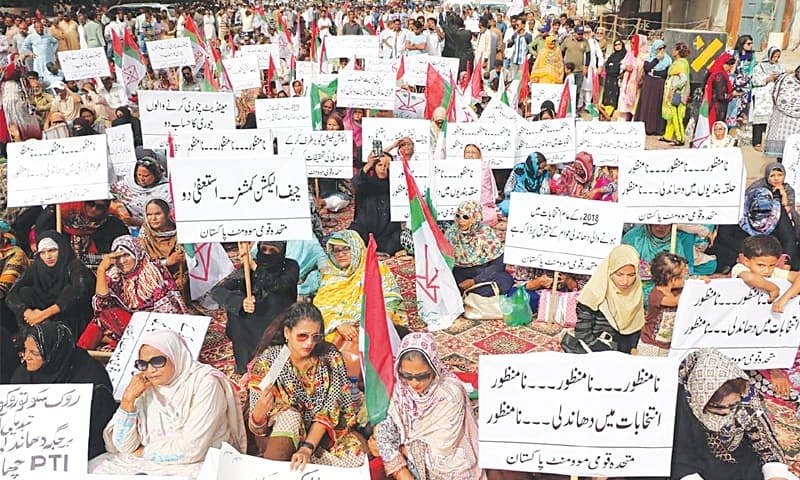 KARACHI: The Muttahida Qaumi Movement-Pakistan (MQM-P) on Thursday staged a protest sit-in outside the regional office of the Election Commission of Pakistan (ECP) against alleged rigging during the July 25 polls. The protesters demanded resignation of the chief election commissioner, recounting of votes in all Karachi constituencies and forensic examination of thumb impressions on ballot papers. Dozens of party workers started converging outside the ECP office in Saddar in the first half of the day and by the second half, a large number of them were present with their leaders. Carrying placards and banners, the political workers chanted slogans against the ECP for failing to organise fair and free elections not only in Karachi but in other parts of the country too. “We have strong reservations over the election results,” said senior leader Dr Khalid Maqbool Siddiqui. “We want the chief election commissioner to resign in view of his failure to hold elections fairly. “We also demand recount in all constituencies of Karachi in the presence of polling agents. In this process, we also want the authorities to carry out forensic examination of thumb impressions,” he added. Interestingly, the MQM leaders in their speeches chose to attack the Pakistan Peoples Party (PPP) calling it the beneficiary of rigging and did not name the Pakistan Tehreek-i-Insaf which won the seats from the constituencies which were believed to be the strongholds of the MQM and where it had never tasted defeat in three decades. “The real engineering began after 6pm [on the polling day],” said Amir Khan. “The trend started in Punjab and then entered Sindh’s cities like Karachi and Hyderabad. It’s beyond our understanding that the PPP was awarded 75 seats instead of 65. “We demand recounting in all of Karachi’s constituencies. In 2013, people said it was an election with 35 punctures but the 2018 election is worse which you may call completely punctured,” he added. With only six seats in the National Assembly, the MQM-P has already made it clear that it is forging a coalition with the PTI which lacks simple majority in the lower house of parliament. 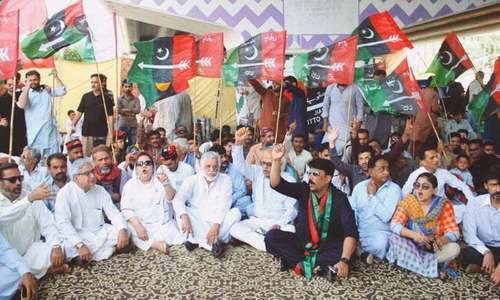 The tone and measured speeches in Thursday’s protest also suggested that the party had almost lost interest in any partnership with the PPP in Sindh. “We have put our case before the PTI leadership,” said Dr Farooq Sattar. “They have assured us that the PTI will not raise any objection over investigation into alleged rigging or recounting in constituencies where we have serious reservations. “We hope that the PTI will not only raise voice with us against injustice but also help investigate the cases pertaining to rigging,” he added. While talking to media representatives during his visit to different storm-water drains in District East, Mayor Wasim Akhtar said the ECP was responsible for what happened in the polls. Rejecting the election results in eight National Assembly and 16 Sindh Assembly constituencies, he added that such manipulated elections were never witnessed in the country. Referring to his party’s election symbol, the MQM-P leader said the “brand of Karachi was kite” and added that the people’s mandate was stolen. The mayor further said the MQM-P had a central role in the formation of government and added that the citizens of Karachi have rejected the “test tube leadership”. East District Municipal Corporation Chairman Moeed Anwer, Municipal Services Senior Director Nauman Arshad, Municipal Services Director Musheer Ahmed and other officers accompanied the mayor when he inspected cleaning of drains in Akhtar Colony, Rehman Colony, Manzoor Colony, Mehmoodabad, Karachi Admin Society, PECHS Block 6, and Railway Colony. There was no rigging by the PTI. The others, both MQM and PPP are masters in getting the results their way. The trend was clearly towards voting for PTI in urban Sindh except for areas of control of the MQM. So blaming the PPP for rigging the elections is quite justified in the areas of Sindh. An open invitation was offered to any voters for their families votes in return for money and food for three days. Ask any one in the interior of the province and he will tell you.